Yesterday after having lunch with a few friends at an Ethiopian restaurant I was able to spend the afternoon at the Winnipeg Art Gallery (WAG). 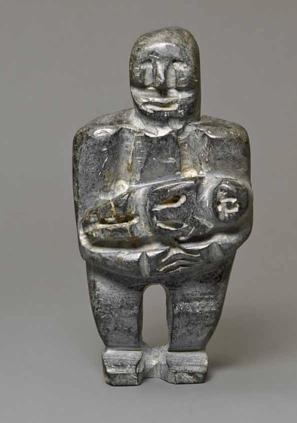 This was the first afternoon I had ever had free time in the city and had heard of their collection of Inuit carvings was the largest in the world. It really was worth it. They had a large exhibit framed around the various decades since 1950. You could see the progression or more so the influence of the outside world in their carvings over the years. The geographic area from which the carvings have come from is huge but the common points the artists were depicting were similar. It was intriguing to see such beautiful work. It started me thinking about the creativity in each piece given the landscape, geography and setting in which the carving was created. There was simplicity and yet in the strongest possible terms a complex beauty you rarely see. Art seems to transcend what we see with our eyes. It begins to take us into a realm that we don’t inhabit very often. To be able to be drawn in by the uniqueness of so many carvings was a wonderful experience. We need to take time, to pause for more than an hour and enter those artful, creative realms where text and noise no longer exist. It refreshes us to be human on occasion. If you are ever in Winnipeg visit the WAG. It is an exceptional place. That is a beautiful piece. I will confess that I didn’t even know there were Inuit carvings.